Beautiful offwhite kanchipuram saree in contrast 8 inches black border wore by Rekhaji. we can customize below saree. Please whatsapp us at +919677063537. Indian brides and their correlation with the ritualistic Kanchipuram Silk saree on their wedding is an evergreen tradition. The Kanchipuram Silk smacks of magnificence, affluence and aesthetic beauty. The dream is not only carried by the bride to be but also her family and her significant other. The sheen on the face of blushing brides reflected on Kanchipuram wedding sarees is a common sight at marriage ceremonies across several cultures in India. 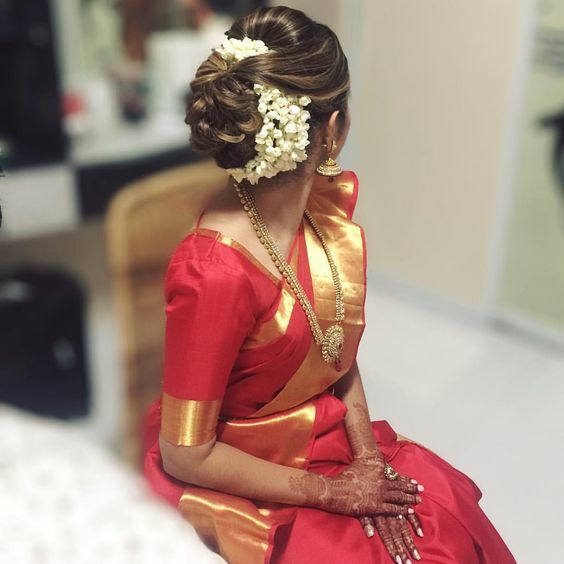 So much so that it is often celebrated by the book, with the bride decked in crimson Kanchipuram and caked in vermillion on her forehead, at foreign destination wedding too! Silk is the most demanded fabric in the countries like India especially during the auspicious occasions like weddings. Though there is huge collection available in Indian wedding saree fleet, kanchipuram silk sarees are known for their uniqueness in presenting your looks on the occasion. Earlier kanjivaram wedding sarees were choice of the older age group due to their limited availability of colors and their heaviness. However, changing trends are having great influence on the weavers of kanchipuram. Though traditional wedding saree colours like red, yellow and creamy white are given due importance for auspicious reasons and keeping their demand in mind(chosen by brides that don’t deviate from traditions), the wedding sarees are now available in trendy and fusion colours addressing the needs of the brides who are looking for fusion of trend and tradition in their wedding attire. Best wedding sarees in London - With only few days left for your wedding, you are sure to feel the jolts in the stomach and tremors in mind about your wedding day sarees and jewelry. However, all you need to do is sit back and relax and picture yourself about how you want to look on your special day. You can gather inspirations from movie stars, celebs or models about your attire and look gorgeous on your wedding day. Stay updated about the latest trends in sarees and its colors as they reflect your true personality. In a summer wedding, you can opt for cool colors like pink, rose, peach or light blue, which will provide a fresh and radiant look to your overall persona. Drape yourself in gorgeous 9 yards and get a stunning look on your wedding ceremonies. A silk saree is an awesome choice for all brides as they are loved by every woman. You can get Kanchipuram silk saree collections, Banaras silk saree, Mysore silk saree or Uppada sarees in pure mulberry silk woven by craftsmen from several places in India. Best places to buy wedding sarees in Dadar - Wedding is the most celebrated occasion all over the country. Be it any part of India, weddings is celebrated with a lot of enthusiasm and joy. Everybody comes in their best outfits and looks stunning, when they do. So be it the bride, or the mother of the bride, or the sisters of the groom, or any female guests- everybody invests in traditional wear. Saree is the most chosen attire as it adapts itself to the wearer. Best places to buy wedding silk sarees in Coimbatore - Weddings are the most windswept and exhilarating times for brides all around the world. Bridal shopping is something which is trickiest yet enthralling part of weddings with countless dresses, jewelry and accessories for the bride to be. However, Indian brides are most excited to buy sarees as this garment has fascinated them since their childhood. Girls want to drape sarees and look beautiful from a very small age and their desire is fulfilled at their weddings. In case you have no knowledge about buying silk sarees, then don’t worry about it as Coimbatore is an exceptional place to shop for wedding silk sarees with immense assortment and outstanding quality at fair prices. Silk sarees - Must haves for Indian wedding trousseau - India is full of diverse cultures and ethnic clothing is at its best in the country. Saree is the most popular ensemble in India; however every region has its particular weave, fabric, design or style of draping it. South India is home to several luxurious saree variants. Silk sarees for weddings are easily available in unlimited options in India, which add sophistication and grandeur in the bride’s beauty. Designs and embellishments of silk sarees vary according to the region, where it has been crafted. The Indian heritage and culture is widely admired throughout the world for its vast diversity and varied panoramas. Indian fashion is greatly influenced by its culture and artisans are located in all the states with different expertise in their fields. Kanchipuram Silk Sarees are made by weavers from Tamil Nadu, who are highly talented and skilled. Kanchipuram Sarees are famous throughout the world for their vibrant colours and delicately woven designs. The sarees are an heirloom and can be passed to upcoming generations. As the saree becomes older, its value increases and it becomes more precious.